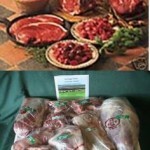 Fresh organic beef & lamb boxes delivered to your door without costing the Earth. Organic farm powered by renewable energy, incl zero carbon local deliveries (elsewhere by courier). Our grass-fed native rare breeds, Red Ruby cattle and Wiltshire Horn sheep, produce the most sustainable meat on the market that is also beautifully marbled, tender, with delicious flavour and we sell at below shop prices. Order and enjoy! Well hung for 3 weeks to improve tenderness and flavour. Each cut is separately packed, labelled and placed in a sturdy reusable box with frozen gel packs to keep cool during transport. The box contains fair share of every cut: fillet steaks, sirloin steaks, rump steaks, topside roast, silverside roast, rolled rib, slow roast, brisket, shin, stewing steak and wonderful minced beef. Same as 10kg box, but 50% bigger and at a lower price then shops and supermarkets charge for ordinary meat. And no wonder, we have cut out all the intermediaries and deliver direct from our farm to your door – by carbon neutral transport. There is no greener way to enjoy meat. 15kg will fit into one and a half standard upright freezer shelf, for 10kg you just need 1 shelf space. Bon appetit! Same as 2x15kg boxes. As Hugh Fearnley-Whittingstall says in his River Cottage Meat book: “The Red Ruby cattle are extremely well adapted to unfertilized grazing. They grow more slowly … It is this natural growth pace and natural diet that makes the close-grained, well-marbled meat British beef at its best. Well hung for a week. Each cut separately packed, labelled and delivered in a reusable box with frozen gel packs. 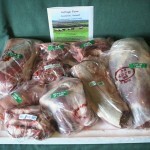 Box contains half an organic lamb, ~9-10kg of cuts: leg, shoulder, loin chops, lamb chops, breast and neck. The leg and shoulder can be left whole or cut in half and any of the cuts can be minced. Takes up 1 tray in a standard upright freezer. Delicious! Well hung for a week. Each cut separately packed, labelled and delivered in a reusable box with frozen gel packs. Box contains a whole organic lamb, ~ 20kg of different cuts: leg, shoulder, loin chops, lamb chops, breast and neck. The leg and shoulder can be left whole or cut in half and any of the cuts can be minced. 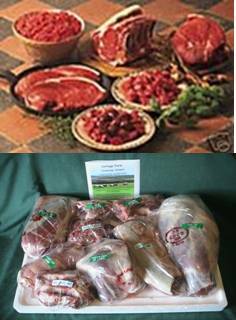 10kg of well hung fresh organic Red Ruby beef, every cut: fillet steaks, sirloin steaks, rump steaks, topside roast, silverside roast, rib of beef/ rolled rib, slow roast, brisket, shin, stewing steak and wonderful minced beef. We can mince any of the cuts for you, just ask. 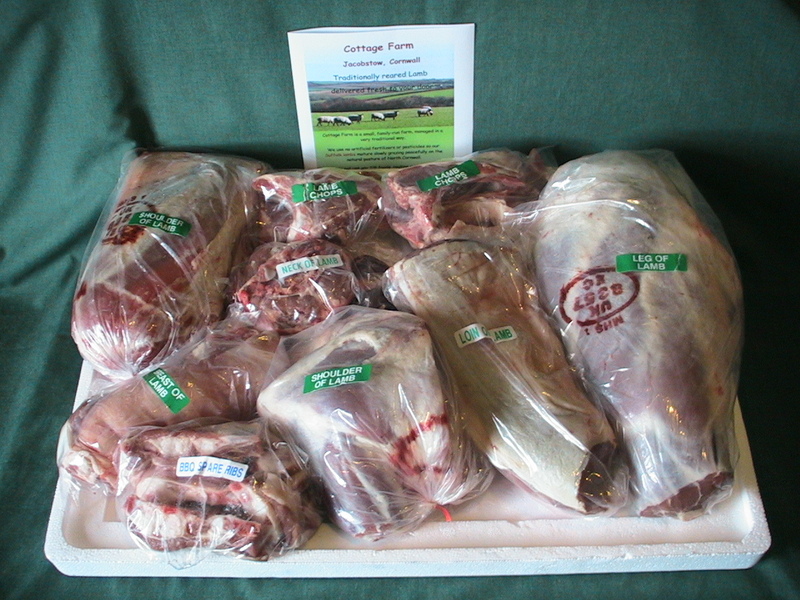 Plus half a well hung lamb – 10kg, cut, packed and labelled, ready for the freezer. Feeds the whole family! 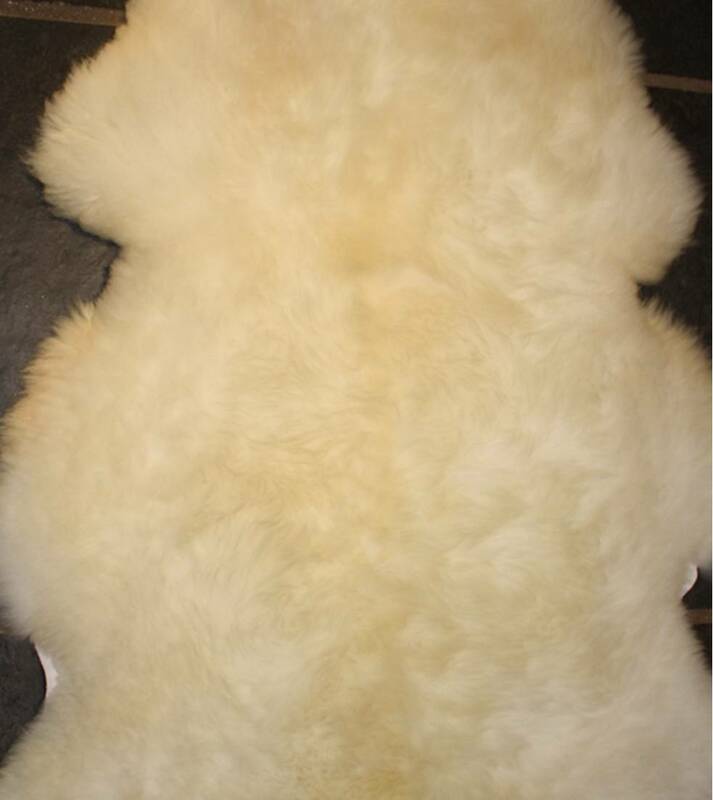 We also offer beautiful and very soft sheepskins. 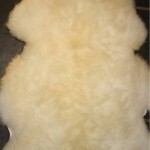 They are all in natural colours of either cream white or brown, please specify your preference.